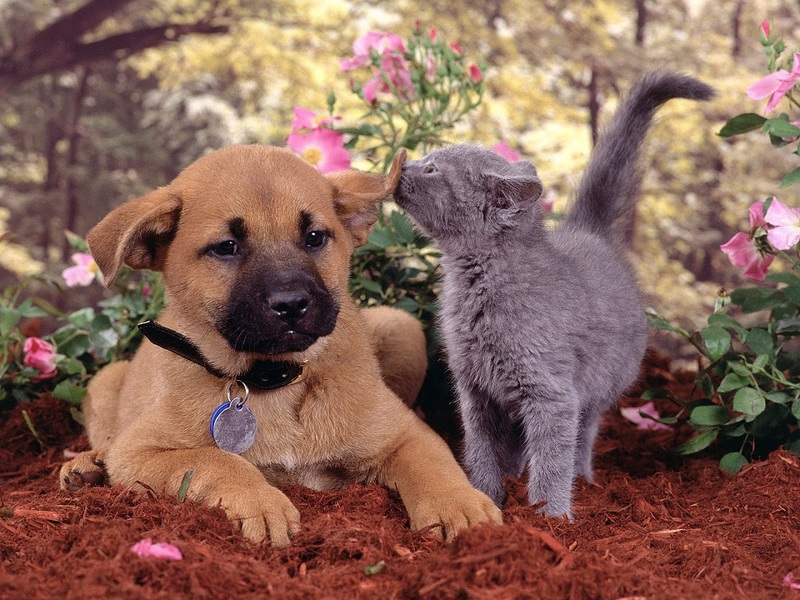 Many people think dogs and cats can not live peacefully together. In fact, someone once coined the phrase "fighting like cats and dogs" and there is obviously some truth to the statement, as it's been around for a while. Well, it's true that some cats and dogs will not make good housemates. They are two different animals with two different distinctive personalities that will not necessarily blend. However, under the right conditions, many cats and dogs can live together in perfect harmony. The majority of cats can happily coexist with a dog if they are given time to comfortably get to know each other. If a puppy and kitten are raised together, they generally will learn right away to tolerate each other, and some cats and dogs grow to be real friends, even playing and napping together. However, if a dog is already an established member of the household and a new cat or kitten is going to join the family, certain precautions need to be taken. When you first introduce a cat and dog, make sure the cat is at the dog's eye level. You should also keep a firm grip on both animals, which will make them feel more comfortable and provide them with a sense of security. If one of the animals seems either aggressive or frightened, immediately remove the cat and try again at a later time. You don't want to force the situation by pushing them before they're ready, as this will only make matters worse. If you take a few minutes several times a day to give the cat and dog this carefully supervised time together, you should soon see them feeling more relaxed around each other. Never leave a cat and dog alone together until you are certain that they are comfortable with each other. If you walk away while they are still checking each other out, you may be sorry when you return. The cat or dog could be scratched or bitten or otherwise injured. Even if there are no visible wounds, an unsupervised interaction like that could traumatize an animal so badly that he remains terrified of other animals for the rest of his life. Even if a cat is not opposed to all dogs and doesn't mind seeing one from a distance now and then, he may have a particular dislike for a specific dog living in his home. Similarly, many people could happily cohabitate with any roommate... except for one particular person that would drive them crazy. Some cats are the same way. A cat may just dislike one particular dog. This may be the case if you've devoted a lot of time and patience to trying to get a cat and dog comfortable with each other, but the scratching and hissing aren't letting up. If you are ready for a new kitten or cat to join your family, help your dog get accustomed to the idea, too. Under strictly supervised conditions, allow the cat and dog to sniff and inspect each other to their hearts' content. This interaction should get them used to each other in no time. If, however, they seem to be incapable of getting along, you may need to reevaluate your pet situation.